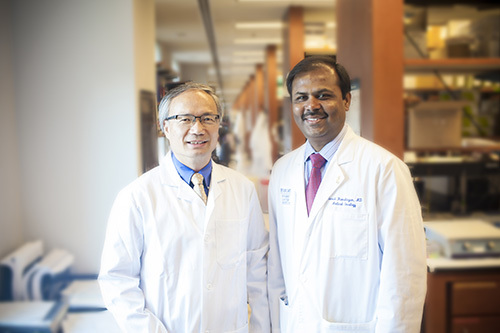 Haian Fu, PhD and Suresh Ramalingam, MD, two recipients of a 2017 Synergy II Award. Seven Winship members are among the recipients of 2017 Synergy II Awards from Emory's Woodruff Health Sciences Center. Synergy Awards are designed to spark new, synergistic interactions and high-impact science among teams of faculty representing at least two schools within the Woodruff Health Sciences Center. Applications for the next round of Synergy Awards are due June 30. Learn more about applying for a Synergy Award. "Structural Basis for the Autoinhibition of von Willebrand Factor"
"Development of cancer patient- derived organoid system for high throughput therapeutic screening and precision oncology"